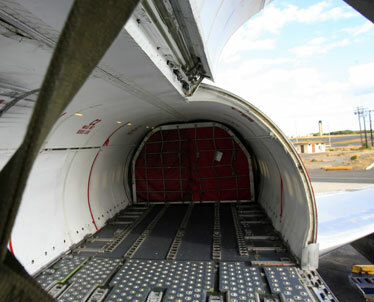 Aloha Airlines is holding an auction Monday for its cargo unit. Aloha Airlines vowed to take "necessary legal actions" to prevent a disruption in air-cargo operations after its pilots union sued the company yesterday and threatened to strike if no labor agreement is reached. The company, which is holding an auction Monday to sell its profitable cargo unit, called the threat of a strike "a negotiations ploy" and said the Air Line Pilots Association is trying "to hype the media." "No legal right exists under the law," Aloha said. "These are extraordinary and difficult times, and Aloha is doing all it can to keep its air-cargo business operating in order to protect the state's economy." Aloha flies 85 percent of the state's air cargo, as well as all the U.S. Mail to Maui and the Big Island. But the pilots, who said they "may strike any or all of the company's operations" at 12:01 a.m. on April 26 without a labor agreement, said they have the right to strike because management's "total disregard" for the pilots' collective-bargaining agreement during the past few weeks has triggered a "major dispute" under the Railway Labor Act, which governs airline contract negotiations. ALPA is seeking an order from the court to get Aloha to comply with its contract, and has asked federal Bankruptcy Court not to keep it from striking. "ALPA is ready to take any steps necessary to ensure that our contract is upheld by this management," said Capt. John Prater, president of ALPA. "We can't prevent Aloha Airlines from ceasing its passenger operations, but we can prevent this management from unlawfully rejecting the legally binding contract they negotiated with their pilots." Earlier this month, Aloha, fearful of a cargo-pilot walkout, filed a motion seeking a temporary restraining order but later voluntarily withdrew it -- at the urging of Bankruptcy Judge Lloyd King -- to facilitate labor negotiations. Among the issues alleged by ALPA in its lawsuit are the company's failure to follow seniority flying rights as called for in the agreement, failing to follow job-security and successorship provisions of the agreement that would require the purchaser of Aloha's cargo unit to hire Aloha's cargo pilots, and the failure to make retirement plan contributions and maintain benefits. Aloha has begun training senior pilots in accordance with the agreement, but the pilots union said those pilots are being recalled out of seniority order. One source familiar with the training situation said those pilots are not getting paid for training. "That's obscene," the source said. "Who goes to work and doesn't get paid, particularly when you have a contract that tells you precisely what you'll get paid when you're at training?" ALPA said it has received no assurances from Seattle-based Saltchuk Resources Inc. that Aloha's approximately 40 cargo pilots will be retained after the deal closes on April 25. Saltchuk, which has offered $13 million for the cargo operations, specifies in its proposal that Aloha needs to continue running the cargo operations -- at Saltchuk's expense -- during a transition period after the deal closes so that service can continue uninterrupted. Also, Saltchuk said it needs the additional time to obtain the necessary regulatory approvals to operate the business under Aloha's operating certificate. A strike by Aloha's pilots could scuttle the deal. Saltchuk's offer isn't assured of being accepted since other bidders are entitled to come in during the auction to top Saltchuk's $13 million offer. But Saltchuk already has incorporated a new Hawaii subsidiary that it is calling Aeko Kula Inc., or "golden eagle" in Hawaiian. In addition, Saltchuk has applications on its Web site for captains, first officers, mechanics and other positions for its Aloha operations, which it intends to operate under the Aloha Air Cargo identity and brand. When Saltchuk announced its purchase offer, it said its goal was to retain as many of the Aloha Air Cargo employees as possible. But Aloha's pilots union said the issue should be clear cut. "The pilots go with the operating certificate," the source said. "If more than 20 percent of the (cargo planes) are transferred, the collective-bargaining agreement says the pilots have to transfer with it."